Early 18th century. Cartographer Jonathan Green undertakes a scientific voyage from Europe to the East. Having passed through Transylvania and crossed the Carpathian Mountains, he finds himself in a small village lost in impassible woods. Nothing but chance and heavy fog could bring him to this cursed place. People who live here do not resemble any other people which the traveler saw before that. The villagers, having dug a deep moat to fend themselves from the rest of the world, share a naive belief that they could save themselves from evil, failing to understand that evil has made its nest in their souls and is waiting for an opportunity to gush out upon the world. Starring JASON FLEMYNG (Lock, Stock and Two Smoking Barrels) and CHARLES DANCE (Game Of Thrones). 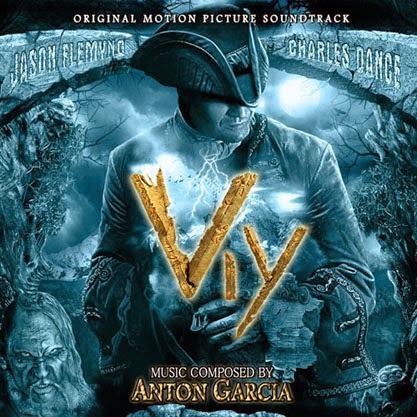 The music for VIY, written by ANTON GARCIA (Jacked$, Law Of Corruption) is a rich blent of beautiful swashbuckle melofies, somber passages for solo strings and strong omenous passages featuring the muscle and grace of a full orchestra and choir. The result is very elegant uptempo, energetic and very enjoyable adventure film score. The music was recorded at Smecky Music Studios by the City Of Prague Philharmonic Orchestra, conducted by Adam Clemens. Produced and mixed by the composer. Dark mystery with a lot of great horror score moments from composer "ANTON GARCIA" as we follow the trail until the end... the end? Old Church Session from the film "VIY"